Discover the difference at Lahaina Cannery Mall, where a historic pineapple cannery has been transformed to a contemporary shopping mall. 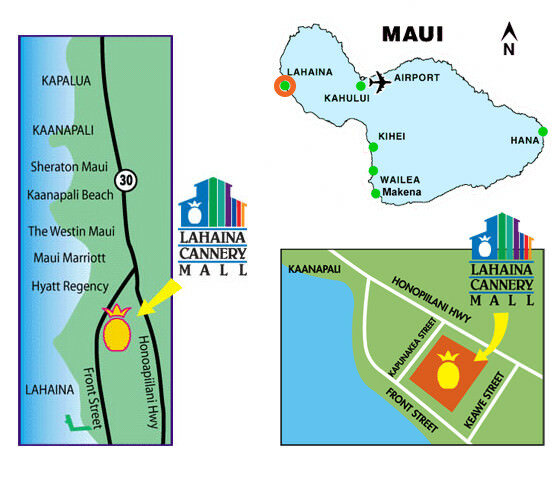 Located on the west side of Maui, Lahaina Cannery Mall is conveniently located near Kapalua and Kaanapali as well as Lahaina. From the upper west side such as Kaanapali and Kapalua, simply follow Honoapiilani Hwy south towards Lahaina. Lahaina Cannery Mall is located on the ocean side, right off of the highway. There is ample parking spaces plus has a 24-hour Safeway for convenient grocery shopping.